Why Cao Dai Temple is special ? Founded in Vietnam in the early 1920s, Cao Dai is based on the main religions of the East and West and takes as its saints characters from different cultures, such as Joan of Arc, Victor Hugo, Shakespeare and Lenin. Today the religion has approximately 1.5 million followers. The temple in Da Nang, the second largest in the country, houses representations of the Divine Eye, the emblem of the doctrine, as well as the founders of Islam, Christianity, Taoism, Confucianism and Buddhism. Caodaists believe that all religions are ultimately the same and seek to promote tolerance throughout the world. Worshippers at the Cao Dai Temple strive for world peace and harmony with beliefs steeped in a number of world religions. Followers must obey the five virtues of Confucianism – humanity, obligation, civility, knowledge and reliability and have belief in the Buddhist principles of rebirth and karma. Watching Caodaists pray is one of the major highlights when visiting the temple as they dress in long flowing robes of white for lay followers, yellow, blue or red for priests whilst bishops have the Divine Eye embroidered on their headpieces. During worship, men are seated on the right and women on the left with all devotees seated in orderly rows. The building is a combination of Neo-Gothic, Baroque and Oriental design and is very ornately decorated including dragon wrapped pillars, seven-headed cobras and ceilings of sky blue. What to explore at Cao Dai Temple? It's simple from the outside, and an inattentive passerby could easily miss it. Try to take a peek inside though. The most colourful time to visit is when noon prayer is taking place, but do be respectful and wait until prayers have finished. Once completed you are welcome to wander inside to check out the interesting interior, decorated with typical Cao Dai ornamentation -- note the globe at the rear of the interior holding the all-seeing eye. A sign reading van giao nhat ly (all religions have the same reason) hangs from the ceiling in front of the main altar. Behind the gilded letters is a picture of the founders of five of the world’s great religions: Mohammed, Laotse (wearing Eastern Orthodox–style robes), Jesus, a Southeast Asian–looking Buddha and Confucius (looking as Chinese as could be). How to get to Cao Dai Temple? The best way to visit the temple is by taxi or motorbike. It takes 5 mins driving from Da Nang Railway Station and 15 mins from Da Nang Internationl Airport. You should wear the polite clothes in the reverent place. The architecture is Vietnamese and provides a good photo opportunity. Heir rituals are held 4 times a day: 6AM, 12:00PM, 6PM and 12AM. It is located at 63 Hai Phong Thanh Khe Da Nang Vietnam. Be sure to visit the building behind the main temple - as it has some interesting historial artifacts. I think this religion is unknown in the west. I would love some explanation but I saw none here. Like any other place of worship its not a museum and does not seek to explain . This was a quick visit as there is little to see. Timing your visit to see any sort of event will increase the value of your visit ten fold. We made an unplanned stop and there weren't many people around to explain the history or relevance of many things. The property was beautiful but simple. It felt like a monastery where people live on site more so than an attraction or spectacle of some kind. Not bad, I wish I understood more. The kids slept in the bus though, they were bored to tears by it. I've visited the Cao Dai Holy See in Tay Ninh, and of course this one pales in comparison. However, the style and the warm reception from the people there are the same. If you're looking for a stunning architecture, you won't find it here. The good news is, this is not like the "commercial" temples in China where donations are heavily suggested (sometime you'd have to cough up some serious moneys for the entrance), or was built specifically for tourists. This was how the religion was explained to me by a Cao Daist, not from the religious perspectives but more from a logical/historical point of view. Unproven, so don't beat me up for it. 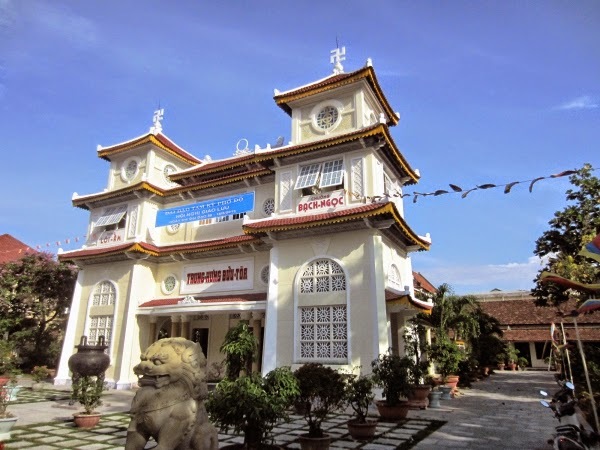 During the French occupation, the "educated" class in Vietnam realized that an old culture - heavily influenced by the Chinese culture would lose its appeal with the young crowd. The new "westernized" culture brought by the French was frown upon by the older generation. The founder of Cao Dai cleverly came up with the idea of a new religion that would be appealing to both the old and the new generations. It considers Gods from other religions as Messiahs or Divine Spirits, while the "Supreme Being" (God) that was represented by the See-All (Left) eye on the Globe. It went one step further with the messiah/divine spirit concepts. It said that Messiahs are Saints, and not just religious "Saints" that were widely accepted before (Jesus, Buddha, Quan Yin, etc. etc. ), but also anybody who have contributed to the good of humanity, including writers, politicians, commoners, That explains Victor Hugo, Sun Yat Sen paintings on the main wall at the main temple in Tay Ninh. These are classified as Divine Spirits - The man also gave an explanation from the religious perspective, but it was too complicated and mystifying (12 fold hierarchy). I found the logical/historical explanation fascinating. Initially the French tolerated the expansion of Cao Dai, but it grew fast and wide. People came as far as Cambodia to visit the main temple, and the religion spread throughout South Vietnam. Its influence competed with the Vietminh and various rebel groups in South Vietnam, as well as the French government, and later on with the Vietnamese government after the war. 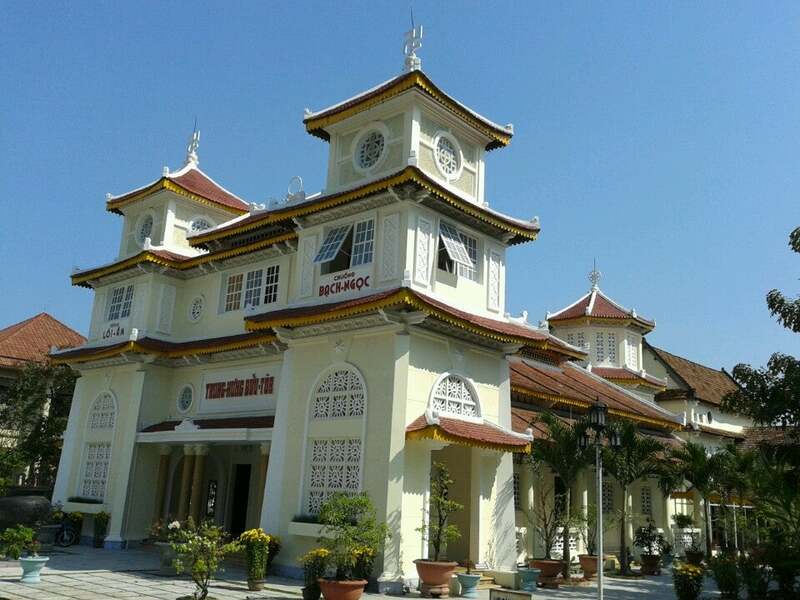 The Vietnamese Government confiscated most of the lands and buildings in the Holy See in Tay Ninh, and still occupied them until today. 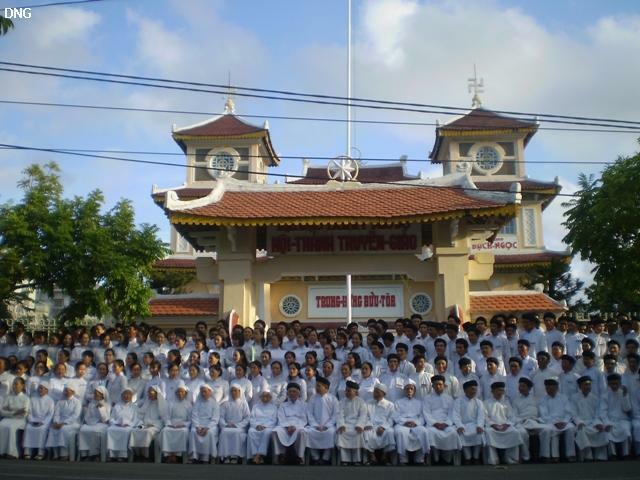 Cao Dai received official recognition in 1997, but it was said that government interference has undermined the integrity and independence of the religion. The Da Nang temple was one of three run-away sects from the Holy See in Tay Ninh, but it still follows the same rituals. I've been to several Cao Dai temples, they were all fascinating, not for the architecture but for its people. It reminds me of the open-arm policy of the Golden Temple in Amritsar. For those who plan a visit, their rituals are held 4 times a day: 6AM, 12:00PM, 6PM and 12AM. Note that this is a true temple and not a tourist attractions. Due to the lack of recognition from the government for a very long time, the people on site are very happy to see visitors and a chance to explain their religion. Most don't speak English, but if you happen to meet a visiting high ranking person, it's worth the time to hear their stories.